Bela Lugosi’s last quote of 1941 (allegedly, for like any movie star comment, it may well have been written by a publicist) is in reply to how he enjoys being killed in almost every film he appears in. “It’s a living” was his reply. Lugosi was making a decent living in 1941. Movie horror would be in vogue through the World War II years, and Lugosi worked steadily. None of his four films of 1941 could have been very satisfying. He played small roles in two Universal movies (The Black Cat and The Wolf Man). Both give him a fine moment or two, but otherwise Lugosi has little to do. His other two films come from Monogram Pictures, home of low-budget, low-quality film making. 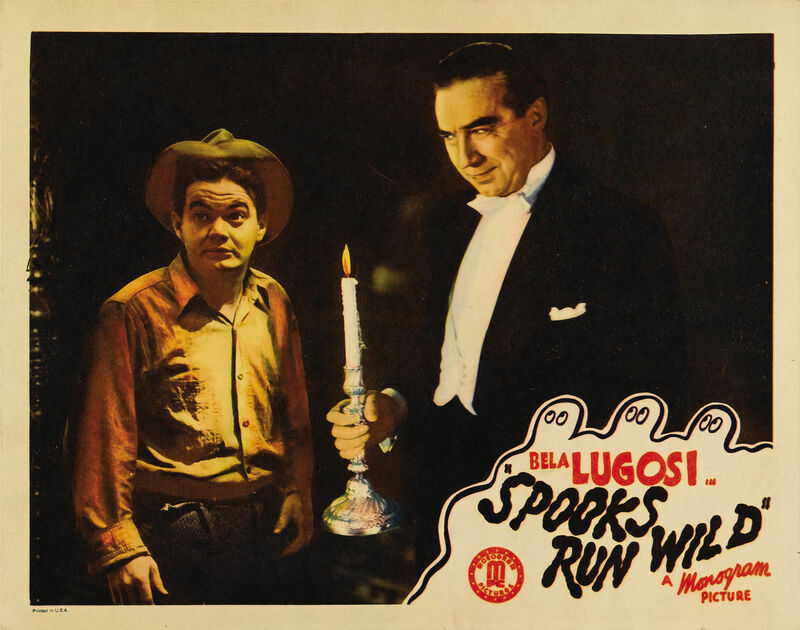 Spooks Run Wild is an East Side Kids farce with Lugosi mostly lurking in the shadows. The Invisible Ghost gives him a decent role, as a man tormented by the spectre of his dead wife. Whatever depth Lugosi might have brought to the part is buried beneath Monogram’s typical poverty row trappings. In 1941, Lugosi also hosted a stage horror show in Waterloo and Chicago, “One Night of Horror.” The show was a vaudeville review, with a few offbeat touches (such as a man-in-a-gorilla-suit running amok on stage). Lugosi’s ability to “work a crowd” is often overlooked, and the show got good reviews. It is a harbinger of the kind of stage show that the actor would play in the late 1940s when work again became scarce. He might be a horror man to the movie public, but to his son he’s just “Daddy,” and to the neighborhood kids he’s the man who makes the funny faces. He’s Bela Lugosi, Hollywood’s horror man who gained fame ’way back in 1927 on Broadway with his characterization of Dracula. In Waterloo, he is playing in the stage play, “One Night of Horror,” at the Orpheum theatre. Bela likes babies, drinks milk, collects stamps and is good to his wife, only “putting on” his mysterious expressions for the public—and his pay check, which isn’t small. His son, Bela, Jr., 3. In Hollywood, doesn’t take him seriously. “Daddy’s just acting,” the little fellow says. On stage, or in the movies, the horror man shuns makeup, creates his character by facial expression only, wearing no masks. Lugosi was born in Lugos, Hungary, and came to the United States when he was 32 years old. Since 1912 he has been making pictures in Hollywood, but started his horror films in 1931. The formula (which we learned just the other afternoon and are reporting here in case some of you have trouble persuading your guests to go home) is a novel one, and here’s how it’s worked: First, you get hold of Bela Lugosi, the big chills-and-shudder gentleman: then you catch a gorilla: one at a time, you introduce them to your guests—and by that time, everybody that isn’t paralyzed had fled! See how simple it all is? Mr. Lugosi, who is appearing on both the stage and screen of the Oriental theater this week, was the guest of honor the other afternoon at an eventful little party. It was all very nice, really—with Mr. Lugosi being charming and friendly, instead of frightening (in fact, there wasn’t recognizable leer or grimace or scowl to be seen) and with all the other guests relaxing comfortably while he described himself as a hard-working actor and a home-loving gentlemen who avoided night clubs. You can see how serene everything was at this point. In fact, we had no idea that at the next moment a gorilla was to come lunging through the door in one tremendous bound—a big handsome specimen of a gorilla that could obviously break iron bars in two, uproot trees or overturn locomotives! Well, that’s how parties are broken up! The rest of the afternoon, we don’t mind saying, is something of a blur to us—but at least we’ve got Mr. Lugosi’s word for it that he was scared too. So, if you’ve always wondered what it took to make a big horror-man turn pale with fright, now you know. Mr. Lugosi is starred on the Oriental screen this week in The Invisible Ghost, along with Polly Ann Young and John McGuire—and it’s a picture, he assured us, in which there are plenty of murders. On the stage, he is the star of a revue which titled One Night of Horror, in which it is his job to sneak around and terrify the rest of the cast. The picture which he has just finished in Hollywood is The Black Cat, another thriller. About five years ago, Mr. Lugosi appeared in a picture with the same title—this one, however, is based on the Edgar Allan Poe tale, and the cast includes Basil Rathbone, Hugh Herbert, Broderick Crawford and Ann Gwynne. 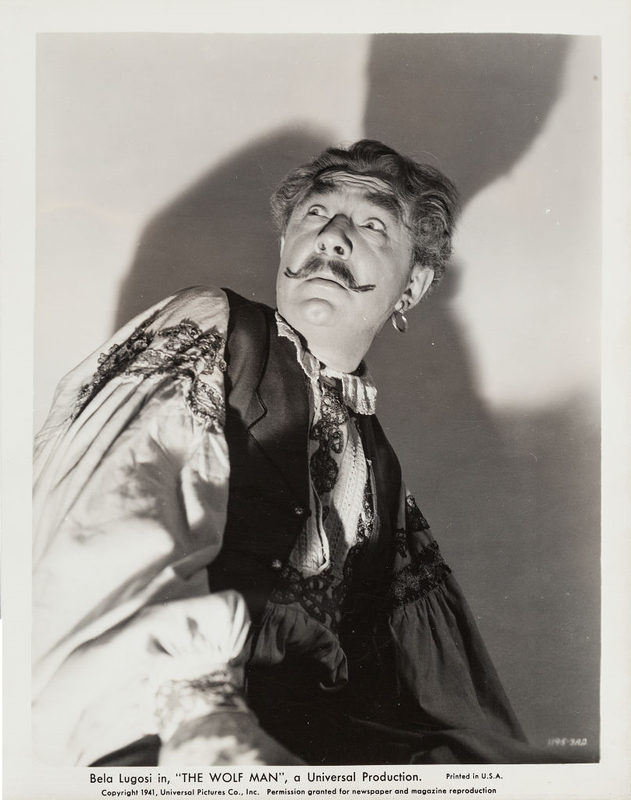 Once we returned to sanity after our frights, we were introduced to Carmen Negri, the gentleman who was perspiring in a gorilla costume and who is Mr. Lugosi’s partner on the Oriental stage this week. Mr. Negri has made a career out of masquerading as a gorilla, first appeared on the screen in the screen in the famed film Ingagi. He proudly displayed his costume which, he said, is equipped with a zipper down the back, made out of bear skins, and rubber which has been molded into a peculiarly realistic and terrifying face. Hollywood – (U.P.) – Everything’s all right again with Bela Lugosi, our favorite spook: he’s just bought a special spook house, so he’ll feel comfortable after spooking hours. B-r-r-r-r. The home of Lugosi’s features dark corners, beamed ceilings, split doors, green glass windows, iron balustrades, high walls, trick buzzer systems, and similar details to delight the heart of a professional Dracula. It cost him a pretty penny, too. And that’s all the more surprising because Lugosi was on relief four years ago, drawing $15 a week from a government which decided that, though jobless, ghosts had to eat. How he happened to be broke and without a spooking chore any place makes one of those Hollywood stories. How he got back into the bogey-man groove again is more surprising still. So he was a zombie in the movies, Frankenstein’s boy friend, the black cat, the bloody phantom, the hungry ape, the Oriental murder-man, and the vampire with the steel claws. He starred in dozens of horror pictures. When things got blackest for Lugosi, so were they for the Regina theater, a neighborhood house on Wilshire Boulevard. It was an independent theater and it couldn’t get good pictures. Audiences wouldn’t pay to see the kind of films it did get. The Regina was about to close its front door when the manager decided on a desperate expedient. He installed a triple horror bill, consisting of films featuring Lugosi, Karloff, and others. To the amazement of all Hollywood, customers intent on being scared to death mobbed the place. Other theater owners in other towns repeated the stunt with the same results. The spook market boomed. Universal and other studios rushed new horror films into production, and there was spook Lugosi again, trying to decide which film offer to take. He started horrifying folks all over the place and he’s been giving ‘em goose pimples ever since. When he finished Spooks Run Wild for Monogram the other day, he was ready to pay cash for his spook castle, erected some 50 years ago by an eccentric and since deceased German count. Lugosi’ spending several thousand dollars to modernize it (leaving in the spooky atmosphere, of course) and all looks well again for one of the pleasantest human monsters we know. Hollywood, Dec. 30 – Every actor lives to die. That is to say, of course, that he invariably looks forward to a neat juicy death scene. It’s pleasant to play romantic close-ups with the Hedy Lemarrs, the Lana Turners, and the Annie (Oomph) Sheridans—but it’s a real thrill to die, and the more tragic the circumstances, the better. But the thrill of kicking the bucket, passing over the Great Divide, doing a demise, cashing in his chips and doing a fade has begun to pall somewhat for Bela Lugosi. He has died in more than 100 stage and screen plays, currently adding one more to his private obituary list in Universal’s The Wolf Man. Perhaps the most notable time Lugosi died was in Dracula when he was put out of his earthly concerns by the simple if somewhat indelicate means of having a wooden stake driven through his heart. Though Lugosi is condemned to a lifetime of dying, he really doesn’t mind very much. “It’s a living,” he says, shrugging his shoulders.